Volunteering on a Medicine project in Nepal is a unique experience, and your role will be strictly observational. As volunteers are not licensed medical professionals in Nepal, the government does not permit any practical involvement in hospitals. You will only get involved with practical work during outreaches. However, you will have the chance to learn about many new medical conditions as you will be exposed to many diseases you would not normally see at home and gain a greater understanding of healthcare in the developing world. 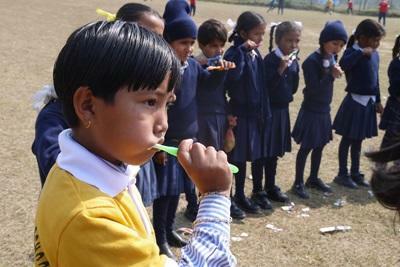 Volunteer Medicine placements in Nepal are based in and around Kathmandu and in Chitwan, about six hour’s drive from Kathmandu. Volunteers work at a variety of placements in hospitals and rehabilitation centres for disabled children in the Kathmandu Valley or Chitwan. Some of our placements are leading referral centres for the functional mobility of physically disabled children. Most of the cases are neglected orthopaedic conditions, such as cerebral palsy, muscular dystrophy, or spinal injuries. You could also work at one of our placements dedicated to providing the best available medical and healthcare in the field of trauma, orthopaedics and rehabilitation. Alternatively you could be placed at a large teaching hospital, which provides intensive care, emergency, and highly sophisticated diagnostic and other therapeutic services at comparatively low prices, with the aim of serving the local community. As such it offers an incredible insight for volunteers hoping to gain knowledge as part of a medical internship. We also offer placements where you may come into contact with many diseases in acute stages of development, which you are extremely unlikely to have seen in the west. Many of these conditions, with symptoms such as diarrhoea and with their origins in malnutrition, are easily preventable and you can be involved in campaigns to increase public awareness around health issues and to help to improve the quality of life by educating people about health and sanitation. You can also work in departments such as general health services, orthopaedics, dental services, ENT, x-ray, ultrasound and ophthalmology. Medical volunteers will also have the opportunity to attend monthly lectures or workshops. Keep in mind, however, volunteers are not assigned to a specific doctor or nurse for the duration of their project. On their first day, volunteers are introduced to the head of the department they are working in, but throughout their project, they will shadow whichever doctors or nurses are on duty. Volunteers working at one of our hospitals may be able to take part in outreach programmes, which are organised by the hospital. These programmes take place on a monthly or bimonthly basis outside of the rainy season (June to September) and offer free health checks and basic medication to suburban or remote communities in Nepal. There are many medical related opportunities in Nepal. If you wish to let us know your particular interests we will try to arrange for you to work in that specific area. For all Medicine placements in Nepal you should speak at least intermediate English. "We spent the majority of our time at the placement with the children, playing and talking. Many of the children having orthopaedic surgery had to stay in the hospital anything from a few weeks to two years and were often very bored. I hope that in some way we relieved their boredom and gave them the affection and attention they deserved." You can join the Medicine project in Nepal for one, two or three weeks if you don't have time to join us for four weeks or more. This project has been selected by our local colleagues as being suitable for short term volunteering for both the host community and the volunteer Although you will gain a valuable cultural insight and work within the local community please be aware that you may not be able to make the same impact as someone volunteering for a longer period.